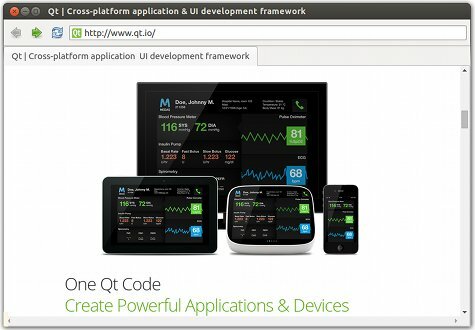 Quick Nano Browser demonstrates how to use the Qt WebEngine QML types to develop a small web browser application that consists of a browser window with a title bar, toolbar, tab view, and status bar. The web content is loaded in a web engine view within the tab view. If certificate errors occur, users are prompted for action in a message dialog. The status bar pops up to display the URL of a hovered link. When the browser main window is loaded, it creates an empty tab using the default profile. Each tab is a web engine view that fills the main window. // We must do this first to make sure that tab.active gets set so that tab.item gets instantiated immediately. title: "Server's certificate not trusted"
text: "Do you wish to continue?" "Do you wish to override the security check and continue?" We create a menu item for allowing fullscreen mode in a settings menu that we place on the tool bar. Also, we create an action for leaving fullscreen mode by using a keyboard shortcut. We call the accept() method to accept the fullscreen request. The methdod sets the isFullScreen property to be equal to the toggleOn property. When entering fullscreen mode, we display a notification using the FullScreenNotification custom type that we create in FullScreenNotification.qml.